Music can be considered as an international language. There are a lot beautiful traditional carols (Christmas carols, Spring carols…). 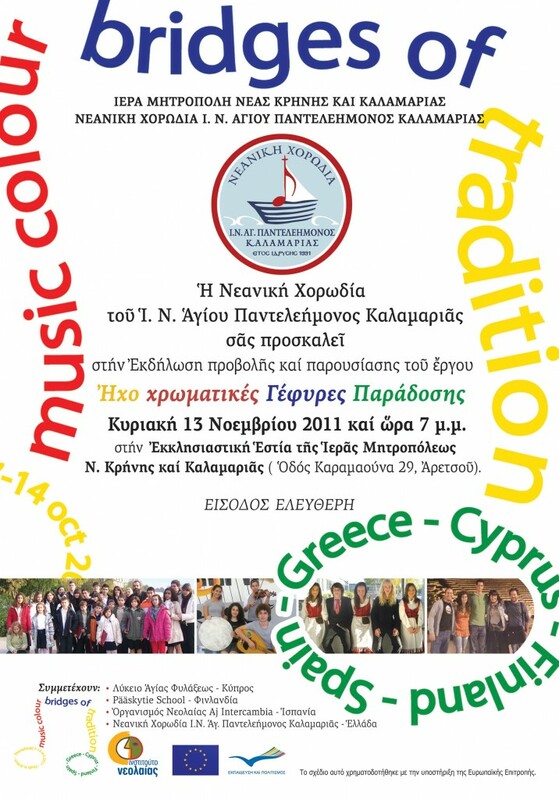 Εach group partner will choose, prepare, present and teach traditional carols from its own music culture. Finally, we will present of our work in public and we will record a cd. This action will take place and is supported by St Panteleimon Parish of Kalamaria. Participants: 5 people from each country (over 13 -25 ) and one leader for each group. Totally 4 countries. Conditions: Accommodation, board and programme costs will be financed through European Commission Youth in Action Programme (Action 1.1). Travel costs will be reimbursed in 70%. Organizations from all 27 EU member countries plus Liechtenstein , Norway and Iceland are eligible to take part.